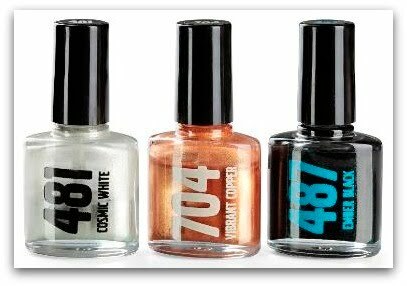 Volvo Introduces Nail Polish To Match Their Cars! I came across this news item and thought you might find it interesting! Volvo is introducing a line of polishes to match one of their vehicles, the S60 sedan. While the colors are not necessarily unique (although I do like Vibrant Copper), the concept is one I would love to see all car manufacturers adopt. Don't you think we should always get a matching bottle of nail polish when we buy a new car? Is there a polish color that matches your car? Mine would be a standard black, so not too exciting there! Volvo is hoping to attract the attention of female car enthusiasts with the launch of three shades of nail polish, as well as a range of accessories, to match some of the colour options available for the brand new Volvo S60. The three shades available are Ember Black, Vibrant Copper and Cosmic White. Volvo has also launched an exclusive collection of selected accessories and products designed to match the new S60, including an iPhone case, sunglasses, leather weekend bags, goatskin driving gloves, and a key-fob. The Volvo S60 Merchandise Collection is available at Volvo dealers or via the online shop. The price for the pack of three nail polishes is €16.90 ($23.10 USD for a set of 3 shades) including VAT. This is so funny, my husband and I were talking about this as we were buying our new car a couple weeks ago! We now have a 2011 Hyundai Sonata in Iridescent Silver Blue Pearl, and I've been casually comparing my pale blue shimmers and holos to it! I know I'm going to find a match, but it would be so much easier if they'd just bottle the color and sell it! That's a great idea. I to would love some polishes to match some car paints. nekosan~that would be great if we could order custom nail polish matching vehicles! I suppose we could, but that would be expensive! Beauty Addict~I know, I thought it was a great idea! Jackie S.~they definitely need to expand the collection, but it's a start! TropicalChrome~ooh, that sounds like a beautiful color! Hope you find the perfect match. Lucy~I agree, I've seen some really pretty colors on cars. Saw a gorgeous mossy green/grey last week on a truck!